Family Maps of Allen County, Indiana (Deluxe Edition) by Gregory A. Boyd, J.D. has recently been published by Arphax Publishing Co. The book is 252 pages and contains information about early Allen County landowners in map form (65 maps in all, including historical maps that show cemeteries and other features), that help you make sense of the township-range descriptions of land found in deeds. The maps are also a way to figure out who your ancestor's neighbors were. So far 32 of Indiana's counties have been published in the Family Maps series. The Indiana Genealogical Society is seeking a volunteer to be an Editorial Assistant for its IGS Newsletter, which is published 6 times a year. The Editorial Assistant is in charge of proofreading each issue of the newsletter for spelling errors, formatting issues, etc. This is not a paid position, but expenses are reimbursed. The time commitment is 5-10 hours per issue. The ability to meet printing deadlines is a must--the Editorial Assistant must be able to quickly proofread each issue and send back any corrections to the Editor within 4-5 days of receiving it. IGS is also looking for someone to take over as Editor for the IGS Newsletter. The Editor is responsible for putting together each issue, using the regular columns and items that are submitted, as well as compiling information from other relevant sources. This is not a paid position, but expenses (such as software, ink cartridges and postage) are reimbursed. The ability to meet printing deadlines is a must; familiarity with using Microsoft Publisher and creating PDF files with Adobe Acrobat is recommended. The time commitment is 15-20 hours per issue. The Indiana Genealogical Society's quarterly publication, Indiana Genealogist, has filled the Editorial Assistant positions but is still looking for someone to take over as Editor. The Editor is responsible for putting together and shaping the 4 issues each year, choosing which of the various submissions (articles, indexes, record abstracts, etc.) to include, and also for contacting various repositories and organizations about contributing either an article or record abstracts. There is also an index issue published early the next year (the index is compiled by one of the Editorial Assistants). The Editor position is not paid but your expenses (such as software, ink cartridges and postage) are reimbursed. Ability to meet printing deadlines is a must; familiarity with using Microsoft Publisher and creating PDF files with Adobe Acrobat is recommended. The time commitment is 20-25 hours per issue (less for the index issue). KILBORN/KILBURN/POWELL--I am searching for the parents of my great-grandmother, Emma Louise KILBORN or KILBURN, who was born 23 September 1834 in Derby, Orleans County, Vermont. She was a schoolteacher in Lafayette, Tippecanoe County, Indiana in 1856. She married my great-grandfather, James Madison SHIPP, 13 September 1856 in Lafayette, Tippecanoe County, Indiana. She lived and raised her children in Boswell, Benton County, Indiana. She died in May 1904 in Yates Center, Kansas, but was buried in Boswell, Benton County, Indiana. Emma’s brother may have been S. Lawson Kilborn, born 28 December 1835 in Kingston, Ontario, Canada and raised in Monroe County, New York. His bio in a Clark County, Illinois history says that his parents were William Kilborn and Catherine POWELL. When a place name is listed as "city" and that is all the clerk wrote, please mark that field as blank (Ctrl+B). We could probably guess what city the clerk meant but we are not allowed to guess -- we can only index what is on the record so if the clerk didn't see fit to tell us what city he/she meant, then it must be indexed without a city. And don't forget -- no abbreviations! Cities and counties are often hard to read on some of the marriage records. If a place name is misspelled on the document and neither indexer A or indexer B is familiar with place names in Indiana, both may simply copy the misspelling. When that happens, since they both spelled it the same -- but wrong -- it will not be highlighted for an arbitrator to take a another look at it. One of our arbitrators offered this address -- http://www.hometownlocator.com/State/Indiana.cfm -- as a place to find the proper spelling of cities and towns in Indiana. And here's a link to a site which details the townships in Indiana -- http://www.stats.indiana.edu/maptools/townships.htm -- for you to try. The family Bible containing information about the BLUE, ALLEN and RAYER families of Indianapolis (see http://indgensoc.blogspot.com/2007/05/query-blueallenrayer-of-indianapolis.html) has been claimed by Sharon Belvin, a descendant of the Blue family. On Friday, July 20, "Genealogical Research Online: Introductory Computer Lab," will be held from 10 am to 3 pm. The workshop will show how to use the Internet to help with traditional genealogy research, what search strategies to use, and how to evaluate the information you find on the Internet. Registration costs $50 for Indiana Historical Society members; $60 for non-members. The deadline to register is July 6. On Saturday, July 21, "Genealogical Research Online: Advanced Computer Lab," will be held from 10 am to 3 pm. The workshop will show how to go beyond the basics of searching the Internet, including hidden gems that can be found in popular genealogy websites. Registration costs $50 for Indiana Historical Society members; $60 for non-members. The deadline to register is July 6. The Pike County Historical Society recently published Pike County Obits and Death Notices 1900-1902, which was compiled by Corless L. Evans. The softbound book (which is 153 pages) contains almost 900 obituaries and death notices that appeared in the Pike County Democrat of Petersburg, Indiana during those years. It is the first in a series of obituary books and it is cross-referenced with Pike County cemetery records. The book is available for $22.50 + $5 shipping & handling. Make checks payable to Pike County Historical Society and mail to: Pike County Historical Society, P.O. Box 216, Petersburg IN 47567. The Pike County Historical Society (P.O. Box 216, Petersburg IN 47567) will meet July 19 at 6:30 pm at the Pike County Museum (406 Main St., Petersburg IN). Guests are welcome. Thanks to all the great indexers and arbitrators who are doing such a fantastic job on this project! Congratulations to all our indexers and arbitrators for another record-setting month! This is a request for help from one of your arbitrators. 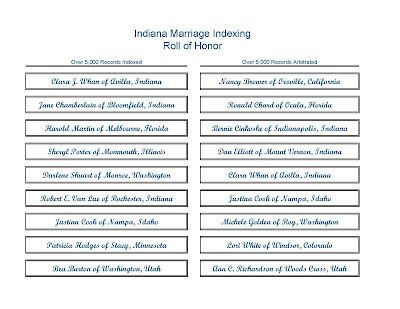 To all of you who are following the instructions for indexing marriage records, a HUGE thank you. To those who haven't quite understood the necessity of entering records exactly as instructed - please take the time to read the instructions. Here are some of the mismatches I am encountering. Cities and states are being abbreviated. Instructions state no abbreviations. If the document reads Ft. Wayne, Ind. - enter Fort Wayne Indiana. With no punctuation. Entering more or less than is on the document. If the document reads, Fort Wayne, do not add county or state. Just enter Fort Wayne. If it reads Prestonsburg, Ky, enter Prestonsburg Kentucky. Entering Co. when it is on the document. Instructions state, do not enter County. If the document reads Allen Co. - enter Allen. Entering street addresses and townships. This is another No No, per instructions. Just tab across or mark Blank. Problems: Entering W or Col. when it says White or Colored on the document. Enter exactly what you see. This one is tricky. Instructions are to enter exactly what you see; however it appears that some study may be necessary to decide what to enter - especially when information on the document does not clearly answer the intent of the question. At any rate, if this is the first marriage, do not enter 1 - or One - or Once. Tab across this field or leave it blank. The intent of the question is to define the number of prior marriages. Problem - entering more than is on the document. For example, if the document reads Geo - do not enter George. Enter exactly what is written (if you can read it). Problem - entering the clerk's name. This field is for the minister or official who performed the ceremony. The only time the clerk's name should be entered is if he or she performed the ceremony. Problem - entering the recorded date instead of the marriage date. Sometime you need to read the entire paragraph to determine when the marriage occurred. I sure do appreciate your help in making my job easier. SMITH/ECK—Looking for information on the parents and family of my great-grandmother, Eve or Eva SMITH (born 22 April 1856 in Lancaster County, Pennsylvania), who married Joseph LEY (born about 1852 in Ohio) on 21 April 1879 in Avilla, Noble County, Indiana. Joseph and Eva Ley were in the 1880 census in Swan Township, Noble County, in the household of Joseph’s father, Andrew Ley, and then moved to Whiting, Monona County, Iowa, where their son John Edward Ley (my grandfather) was born on 17 February 1883. Joseph and Eva both died in California. Eva was the daughter of George Smith (born 1822-1825 in Germany, supposedly in Hesse-Darmstadt; died after 1870) and Barbara ECK (born 1822-1826 in Germany, supposedly in Hesse-Darmstadt; died after 1870), who were married and had young children in Germany before emigrating to Lancaster County, Pennsylvania. They moved to Tippecanoe Township, Kosciusko County, Indiana around 1860 and were there for the 1860 and 1870 censuses. George may have donated a window for a church in Pierceton (probably a Catholic church). Mary Elizabeth Curtis was the daughter of William H. Curtis (born October 1834 in Indiana; died 5 July 1910 in Center Township, Hancock County) and Elizabeth "Eliza" J. PENCE (born May 1829 in Indiana; died after January 1910). William (who was a minister and a farmer) and Eliza were in the 1860 and 1870 censuses in Madison County, Indiana and then were in Hancock County beginning with the 1880 census. Any information about Mary Curtis' parents and siblings would be appreciated.